Please try to avoid combining editions of the combined Characters of La Bruyere AND Theophrastus, with those only containing those by La Bruyere. 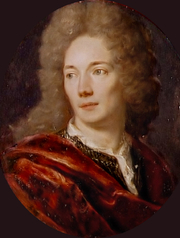 Jean de La Bruyère is currently considered a "single author." If one or more works are by a distinct, homonymous authors, go ahead and split the author. Jean de La Bruyère is composed of 20 names. You can examine and separate out names.